A documentary exploring the existence of UFOs and extra-terrestrial beings. Timely documentary about the UFO ,or really extraterrestrial and intelligently manned space craft, debate that has been baffling military men scientists and astronomers, as well as the public, since the end of WWII. 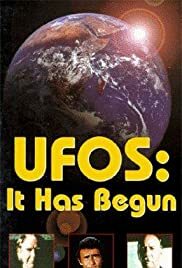 Released about the same time that the Roswell Crash of 1947 became public the film "UFO's :It Has Begun" has gone from being just another one of many UFO films or documentaries to a forerunner to the real facts that came out of the Roswell Crash. The evidence that has been made public, released due to the Public Freedom of Information Act, make the point that there's a real possibility that were being visited by beings or spacemen from outer space not just over the last 50 years or so but since the dawn of human history. There's three cases, or UFO encounters, in the movie that have been known long before Roswell was made public in 1978 that really stand out. These cases show that UFO's may very possibly be real and that the US Government has been covering up their existence from the public in order not to create panic in the fear that they, not the US military and air force, rule the skies and that there's nothing the government can do about it. The first of the three earth-shaking encounters took place outside Louisville Kentucky on January 7, 1948 when veteran combat pilot Capt. Mantell chased, in his P-51 fighter plane, an unidentified object that was reported to be at least 200 feet in diameter. After reaching the 20,000 foot level Capt. Mantell lost control of his plane and crashed or what some eye witnesses said exploded in mid air as he fell to his death below. Mantell who flew hundreds of combat missions in WWII and during peacetime we were told, by the USAF, mistook the UFO for the planet Venus! A pilot of the caliber of Capt. Mantell would never mistake a planet, this in broad daylight, for something that was less then a mile away from him and climbing at tremendous speed unless he was either drunk or high on drugs which, as the autopsy on him proved, Mantell wasn't! The second UFO incident in "UFO's: It Has Begun" that shows that UFO's may very possibly be the real McCoy had to do with the spectacular July 1952 UFO flap over the Alexandria-Clarendon Axis or corridor that covers the very seat of power of the United States Government its capital Washington D.C. For over two weeks aggressive and unconcerned UFO's criss crossed the night skies over D.C, the most heavily defended place on earth, with the USAF totally unable to not only stop them but even keep up with the mysterious glowing flying objects. Playing a dangerous, for the USAF, game of cat and mouse the UFO's out maneuvered, making sharp and unbelievable right angle turns, and out paced, going at speeds of over 7,000 mph, the most modern USAF fighter aircraft, the F-94 saber-jets. Things got so out of hand that President Truman almost called for a state of emergency feeling that the nation was under attack and was unable, with the USAF rendered useless by the speedy unidentified flying objects, to do anything to stop it. Trying to keep the American public from panicking the US military reported that the UFO's seen both on radar and by thousands of eye witnesses, including experienced combat pilots, were nothing more then weather inversions! The third UFO incident of note in the film "UFO's: It Has Begun" took place on October 18, 1973 outside of Cleveland Ohio. It's there when a US Army reserve helicopter came face to face with a large object in the night sky that not only paced along with it but, hovering over the craft, kept the helicopter from descending to the ground by toeing it up into the sky, like it was a giant and powerful magnet. The with the pilot in charge of the craft Capt. Coyne desperately pushing hard on the controls for it to go down! The craft was totally under the unknown flying objects control for at least ten minutes as it inexplicably and slowly ascended upwards, with the UFO hovering just a few feet overhead, from 1,000 to almost 4,000 feet. All this was seen by dozens of eye witnesses as well as recorded on ground radar by startled and terrified air traffic, civilian as well as military, controllers!